When the first iPad came out in 2010, kids immediately took to it. 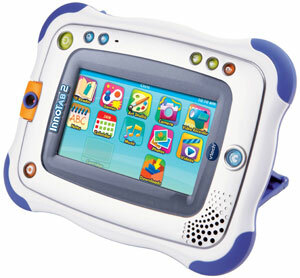 The intuitive touchscreen, already a proven hit with kids on iPhone, was an instant draw. App developers jumped on board and now there are literally thousands of apps–from twitchy games to serious educational tools–for toddlers to teens. With the rise in popularity of Android devices, developers for that platform have followed suit. Over the last couple of years, tablet prices have dropped dramatically; Amazon and Barnes and Noble, with their Kindle and Nook tablets (both built on the Android platform) run a slew of kids apps, plus (of course) e-books, games, videos and loads of other content, and connect directly to their e-stores. And with multiple profiles, it’s possible to lock these devices down for a kid-friendly experience. If you’re willing to spend $200, you’ll get a tablet that’s powerful, with room to grow. More recently, educational electronics company, LeapFrog has hopped into the kid tablet market as have Vtech, Oregon Scientific and even Toys R Us. Some have created devices that run on proprietary operating systems, but many use Android. Several of these have nearly the power and functionality of grown-up tablets, but offer a kid-friendly interface, parental protections, and an extra tough case. With so many options, you may be wondering which is best for your child. Here's our take on the most popular, and the ones that stood out to receive our Editor's Choice. From educational experts and makers of many, battle-tested kid products, LeapFrog, the LeapPad is a great toy kids craving the tablet experience. It comes with back and front cameras, video player, a stylus and arrives pre-loaded with LeapFrog Pet Pad, Story Studio, and Art Studio. Cartridges for additional apps cost $20 to $25 and are far richer than typical iPad or Android fare. Plus, it’s compatible with cartridges for Leapster Explorer if you already have that toy. Also, smaller, downloadable applets are available for $5 and up. 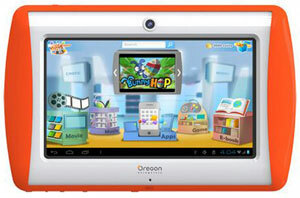 This product is comparable to direct competitor, LeapPad, though with less solid educational content. It comes pre-loaded with a photo viewer, video player, MP3 music player, e-reader, art studio, one tilt sensor game, one augmented reality game, an e-book, art studio app, notes app, friends list, calendar and calculator. The InnoTab has 2GB on-board memory and an SD card slot. Additional apps can be purchased for about $25, or downloaded online on VTech's Learning Lodge Navigator. 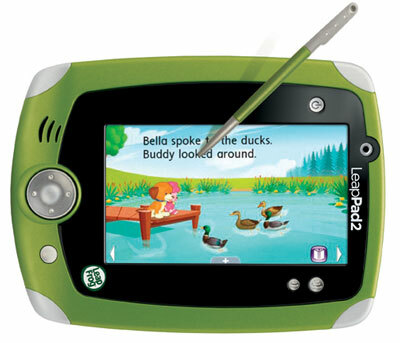 The MEEP is advertised as having all the features of LeapPad and InnoTab (ruggedized plastic case, parental controls, curated MEEP app store), but with grown-up features such as Android 4.0 Ice Cream Sandwich, 7-inch screen, 1 GHz ARM Cortex A8 CPU, 512 MB RAM, streaming video to TV via HDMI slot. There are two modes, Android, where the parental controls live, and MEEP, the restricted kids interface, with access to apps and web content. The set-up is difficult, however, and screen response and resolution are disappointing. 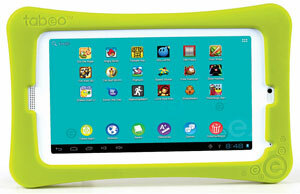 The Tabeo is a 7-inch Android 4.0 ICS tablet. It has an impressive 4 GB of RAM and built-in Wi-Fi and camera. 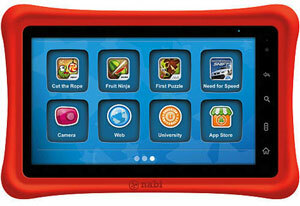 Tabeo comes loaded with over 50 apps including Angry Birds Fruit Ninja and Cut the Rope. You’ll also have access to a curated app store, which includes free apps and thousands available for purchase. Parents can set limits on the amount of time their kids can play the device daily or even weekly. Unfortunately, the low-res, front-facing camera, weak battery life, and 800×480 screen all miss the mark. 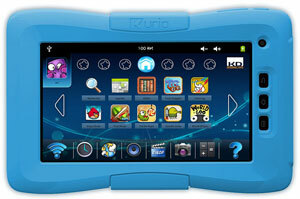 Another in this mid-range, kid-targeted tablet category, the Kurio also uses Android 4.0, and has a 7” screen. The tablet packs a 2.1 megapixel camera, multiple ports, including the miniUSB, miniHDMI, headphone and mic, miniSD Card slot and DC power port. At the heart of the device is a parent interface that gives guardians command of how long and the type of content their charges can access. The Kurio store is a curated version of Google Play with thousands of apps. Unfortunately, poor battery performance (around 3 hours) and some software issues turn a great idea into a mediocre product. The latest challenger to the Kindle Fire, Barnes & Noble’s Nook HD is thinner and lighter than its closest competitor, and has a great, bright screen. The device comes with 8 GB on-board (plus a MiniSD slot for more), and allows up to five separate profiles, so different users can have their own menu of books, videos and apps. The high-density screen has an eye-popping1440 x 900 resolution (vs. 1024 x 768 on the iPad Mini), and beats others in this category. Two drawbacks for kids: First, there’s no camera. Second, B&N’s app and entertainment selection are far behind Amazon’s, Apple’s and Google’s. 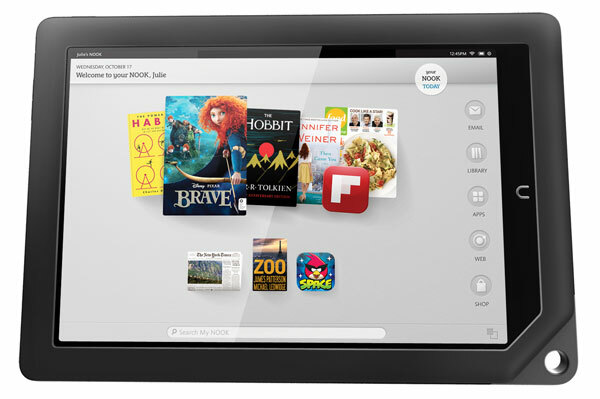 Of course, the Nook supports multiple formats of e-books, which can be borrowed and downloaded from most public libraries. With the considerable weight of Amazon’s massive media selection behind it, the Fire HD’s big draw is for video, e-books and music. 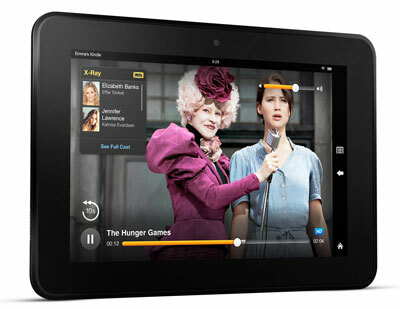 The $199, 8GB version of the tablet has a 1.2 Ghz dual-core processor and a 1280x800 display. There’s a front-facing camera and, most useful for parents, Amazon’s FreeTime feature that lets parents set the child’s profile and determine the type and duration of content used. Because the Amazon apps are available on a wide range of products, you can purchase, say, a movie on the Fire HD and watch it on your Windows or Mac laptop, Android smartphone or TV via your Xbox Live account. This is basically a Google Nexus 7 with a sturdy silicon bumper and kid-friendly interface. The Tegra 3-based hardware beats the others in this category on speed and performance. The Nabi 2 features a wealth of ports not even found on Amazon’s Kindle Fire HD such as mini HDMI, microSD and mini USB. The screen is bright and responsive, too. You’ll soon have access soon to Google Play market for a host of games, videos and music. Meanwhile, Nabi can connect to Fuhu’s app store for over 500 approved apps, and Amazon’s app store for thousands more. Lastly, there’s the necessary parental controls that allow you to set content type limits and a Chore List that rewards kids for activities away from the Nabi. You’ll pay more than for other kid-centric tablets, and you’ll be glad you did. Can you download angry bird and cut the rope on the innotab. Also can you get on the internet like mickeymoseclub etc.? I’ve been searching for a tablet for my young son. He’s taken a liking to my iPad and I cannot get my work done. This article has given me resources that I didn’t find anywhere else. And, on Black Friday, I saved over $100 on the recommended Nabi tablet.